The opening scene of One of Us sets the tone. In the documentary’s first moments, Etty, whom the viewer knows nothing about, places a 911 call to protect herself and her children from her husband’s family banging down her doors. These characters are in a state of crisis, and the biggest danger comes from their own families and community. We do not yet know Etty, but we know that there is imminent danger. An outside force, in this case the 911 responder, is her only hope for salvation. As the film progresses, the viewer takes the role of the faceless responder, learning piecemeal about the constant crises, and wonders what is to be done about these Hasidic Jews. The camera often views its subjects through windows and bars, further highlighting their supposed insularity and distance from us, the viewers. Throughout the film, a dramatic score and muted, dark colors further the sense of urgency and closedness. 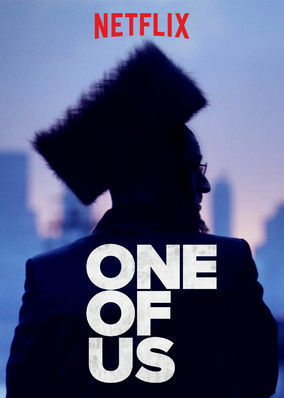 The directors of One of Us, Heidi Ewing and Rachel Grady, decided to release the film directly to Netflix, rather than a more traditional theatrical release, at least partially to ensure that it was as available to as many people as possible, including the population of Ultra Orthodox Jews whom, according to Ewing and Grady, may be secretly viewing the film on smartphones. 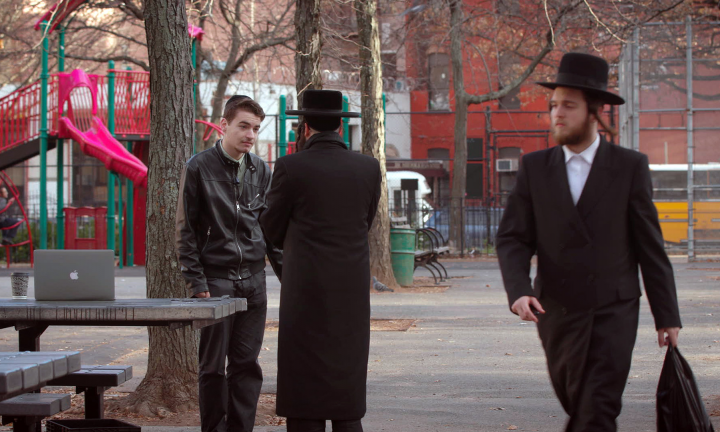 The 95 minute film does not employ a narrator, but instead relies on interviews, raw footage, and graphics to depict the stories of three ex-Hasidic Jews who have decided to leave their communities and their families for a world largely unknown, a decision that makes the documentary feel more like a drama in three overlapping acts. Etty, a survivor of domestic abuse, is fighting for custody of her seven children; Ari, a teenage survivor of sexual assault, battles drug addiction; and Luzer Twersky pursues a bi-coastal acting career. The Hasidic world is portrayed as a world in which women, as well as deviant men, are purposefully made invisible. At the 2012 rally against the internet, which is depicted in the film, one of the rabbis railing against it to an arena full of men paints the web as a feminine bed of gossip, summarizing its appeal with the epithet “yentatyachna.com,” drawing on a long misogynistic tradition of associating women with destruction and temptation coming from the outside world. Despite these injunctions, male Yeshiva students roam the public parks for wifi, looking for an invisible network, a present absence much like the women that remain largely unseen. Etty’s children, still in the Hasidic world, use a reader in which girls’ faces are literally blacked out in thick marker, rendering actual learning impossible. In this context, Etty fights to become visible, to become heard. While these characters’ stories are compelling and painful, directors Heidi Ewing and Rachel Grady miss an opportunity to examine the complexity of the lives of those who leave Hasidic communities, reiterating the narratives Hasidim tell about themselves, erasing Hasidic women, and presenting Yiddish as inherently unknown and unknowable. In one interview, Grady explains: “The Hasidic community was a topic Heidi and I were both very interested in but never thought there was a point of access because they have their own community and have their own language, literally.” 1 1 Quoted in John Guerrasio, “How a Netflix Documentary Got Inside New York City’s Intensely Insular Hasidic Community,” Business Insider, Nov. 21, 2017. Interrogating the complexity of each of these topics would enrich a flattened story. Yet for the more educated viewer, familiar with the history of Hasidim and the “Off the derech” (OTD) movement, hints of complexity are discernible. The messiness of Etty, Luzer, and Ari’s narratives are far truer, and would be more compelling than the harsh and simplistic binaries the filmmakers present, otherwise imperceptible to those without the same background. Nowhere is this flattening of religious communities more jarring than in the film’s treatment of Yiddish. Although the characters themselves speak a mix of Yiddish, English, and Hebrew, codeswitching even within the same sentence, all non-English dialogue is labeled as Yiddish. The mistake is constant, whether it is the loshn koydesh of the sermons or, more egregiously, the Hebrew kiddush liturgy sung at the Friday night meal hosted by Footsteps, an organization founded by former Ultra-Orthodox Jews that assists others in leaving their communities. In that scene, kiddush is simply and incorrectly labeled as “Yiddish singing.” The filmmakers neglect to articulate that this is the participants’ attempt to reclaim a ritual both painful and meaningful around the Shabbos table. 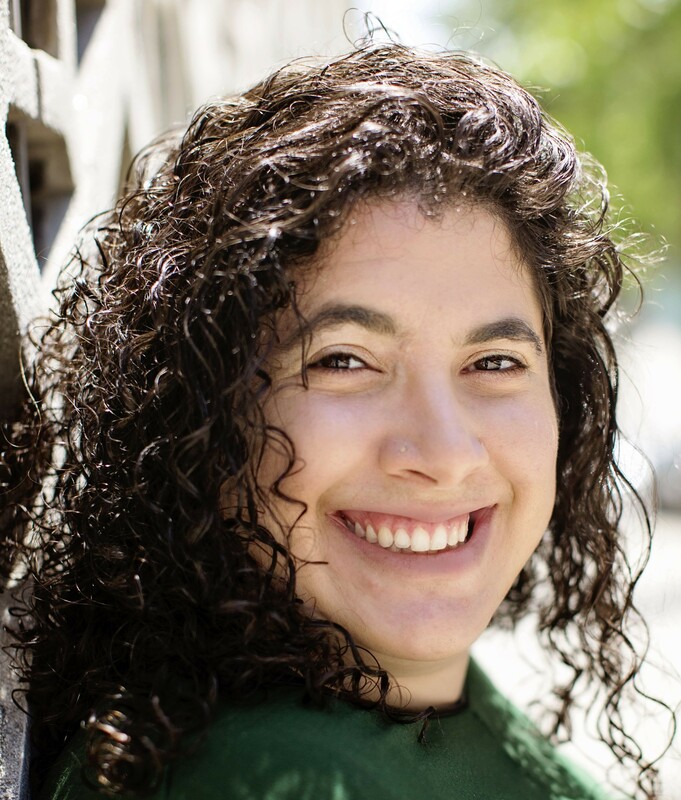 Acknowledgment of an ongoing, complicated relationship with Orthodox Judaism is replaced by an assumed nostalgia for what they have left behind. Ewing and Grady have collaborated in documentary filmmaking for over a decade. Grady is Jewish and Ewing is Catholic, and both admit they knew little about Hasidim before starting the documentary. They run a company called Loki Films, which according to its website, “shines a light on unknown worlds and makes films that matter.” Their approach is inherently peeping, voyeuristic, involving the viewer in a sort of cinematic striptease. 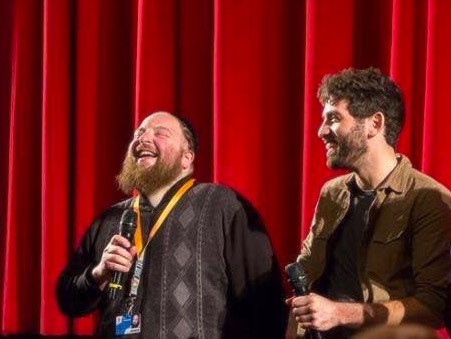 The co-directors first learned about ex-Hasidic Jews by reading about the aforementioned Footsteps in the media. Grady and Ewing explain that their first demand when choosing topics is that they have a special access that no one else has. In this instance, they gained this access by attending Footsteps events, and finally deciding on three subjects—subjects that were compelling but strong enough to withstand the filmmaking process. By far, Etty’s narrative is the most compelling. Etty has braved the wrath of her community to leave her abusive husband and, in the process of the film, loses custody of her children. Despite the focus on her story, the camera does not display Etty’s face until roughly midway through the film, in a moving scene where she removes her sheitel (wig) to display her cropped hair. Earlier, she had recalled how hard it was for her to cut her hair the day after her wedding. Now, the camera tells us, she is free. Not just free to display her own hair, but to display the abuse she was dealt as a Hasidic woman. The converse is also strongly implied: Hasidic women who maintain their communal ties are faceless, nameless, and shapeless, lacking all agency. No other Hasidic or ex-Hasidic women speak in the film, save for Chani Getter, the Footsteps counselor who is, of course, ex-Hasidic as well. I wonder what it would mean to respect the deep pain of Etty and the invisibility she feels without erasing Hasidic women. By neglecting to show these women or give them a voice, the filmmakers commit the same sin as their Haredi gatekeepers, replicating the familiar stories Hasidim tell about themselves. They do not distinguish between subgroups of Hasidim, or even mention the existence of a non-Hasidic ultra-Orthodox sector, whether it be the Yeshivish community or the growing Sephardic ultra-Orthodox population, many of whom are Israeli expats who speak no Yiddish. 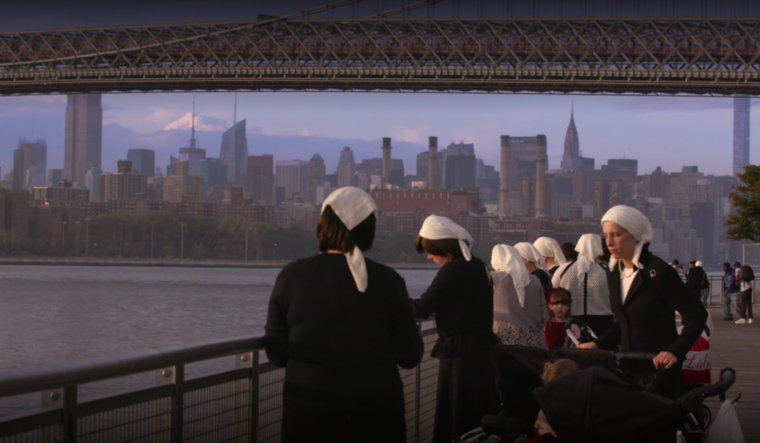 The filmmakers’ framework offers lazy cultural and religious explanations such as suggesting that Hasidim dress like their ancestors to honor them. Even if taken at face value, this claim only applies to the male half of the Hasidic population. I do not wish to list the mistakes of the filmmaker, for my concern is not solely a critique in search of authentic representation, but a critique of the style of filmmaking that flattens its rich subjects with an assumption of radical separation, accepting the insider-outsider binaries of the very community it seeks to interrogate. The filmmakers are gawkers, creating a documentary for a primarily secular audience, fascinated by the cultural other. Each character has a big reveal: Ari’s divulsion of his sexual assault, Luzer’s disclosure of an abandoned family, and the visual reveal of Etty’s face. The discovery of these secrets propels the narrative forward to maintain interest. Yet the narrowness of the filmmakers’ gaze obscures far more than it reveals, leaving the viewer only with the slightly inappropriate pleasure of discovering what is not meant to be seen, together with a sense of moral superiority. 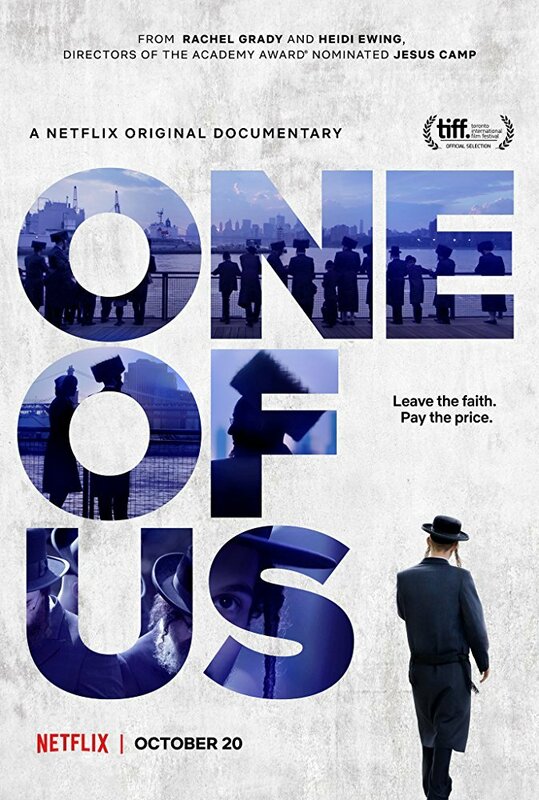 After watching, I am left with a series of questions: How do we tell the story of the pain of those who leave, of those who become “one of us”—a label that includes many of my fellow Jewish Studies academics, as well as readers of this publication? How do we acknowledge the complexity of religious experience without othering our subjects? One way is to acknowledge more clearly the sources of power within religious communities, which those who leave must fight against. The controls Orthodox communities exert and the fidelity they demand are not held in the hands of the singular, unnamed rabbis, but in Foucaultian spheres of power, disparate foci of control upheld by community members throughout everyday life. While the control of ultra-Orthodox communities can be brutal, it is not total. Even in the film, the characters maintain connections with their previous lives. It is heavily implied that Ari’s parents pay for his rehab program. Luzer, the character most disconnected from his former life as he attempts to become an actor, is warmly greeted by an acquaintance. 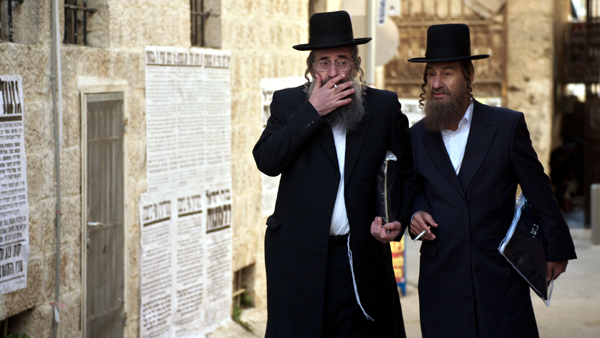 Others have already written about how many ex-Hasidim do not fully disconnect from their families but remain part of a larger community, as do many of those who leave other forms of Orthodoxy. 3 3 See Zalman Newfield, “Few Who Leave Chasidic Life Lose Their Families,” New York Jewish Week, November 7, 2017. Ignoring these bonds simultaneously overstates and understates the totality of communal control and diminishes the complex physical, emotional, and financial efforts of those who leave ultra-Orthodox communities. Chani Getter, the Footsteps counselor who also serves as informant, gets closest to articulating this complexity when she explains that the Hasidic community flourishes due to its paradoxical embrace of liberal democratic society, all while claiming to reject its core values. (Relatedly, I am so ready for the Chani Getter spin-off series.) While the filmmakers broadcast Yiddish-language ads for Donald Trump for President, they neglect to mention the long history of Democratic politicians, especially on the state and local level, who have enjoyed the strong support of the Hasidic community, including Hillary Clinton. While undoubtedly Trump enjoyed far higher levels of support among Orthodox Jews than the general Jewish population, the simplistic association of Hasidim with Republican partisan politics obscures the complex political realities of this community. Those of us who study Orthodoxy and its discontents rail against those who claim that the world we study is simple, fundamentalist, and extreme. Orthodoxy in all its varieties, including Hasidic Judaism, is an inherently modern phenomenon—a reaction to and a participant in the modern world—championing a supposedly timeless and unchanging tradition, even as it is itself a modern and ever-changing reaction to an ever-changing world. The flaws of One of Us are similar to the filmmakers’ previous feature, Jesus Camp, which aims to terrify the secular viewer with the radical nature of evangelical Christianity. In his search for religion, Ari attends some sort of revivalist Christian rally similar to what was portrayed in Jesus Camp, with the not- so-subtle insinuation that evangelical Christianity and Hasidic Judaism are equally fundamentalist, and narrow. Ari rejects both, unsurprisingly, and continues on to explore the far more exciting world of sand, sun, and women in Miami. The filmmakers irresponsibly present Yiddish and its speakers as unknowable and mysterious. Hasidic Yiddish is used to represent an entire community even as it struggles to define itself. Not only do the characters continue to speak Yiddish even as some embrace English, but their unmistakable Yiddish lilt remains, a symbol of a world one can never truly leave behind. The tragic absurdity of Luzer drawing on his Hasidic background, a life he so desperately wanted to leave behind that he fled to the promised land of California, in order to launch an acting career, raises profound questions about masks, tokenism, and the roles we all play—the ghosts that haunt all of us, linguistic or otherwise. One of Us assumes that the Yiddish its characters speak is removed from time and space. It treats the Hasidic community the same way, a fundamentalist oddity otherwise ill adapted for the modern, secular world. And so, I leave you, tayere readers, with these questions: What would filmmaking look like if we didn’t other Yiddish, flattening its richness—a richness that comes from its inseparability from the world in which it lives? What would Yiddish look like if we didn’t see it as a foreign element, a half-dead golem, but as inherent to the tales we tell? And finally, how do we, as scholars and artists, responsibly treat what is so often portrayed as the Yiddish other, the Hasidic community? The traumas of Etty, Ari, and Luzer do not contradict the complexity of contemporary Hasidism, nor do they disprove the porous nature of ultra-Orthodox borders. It is a shame that filmmakers Ewing and Grady could not give these stories their full due. 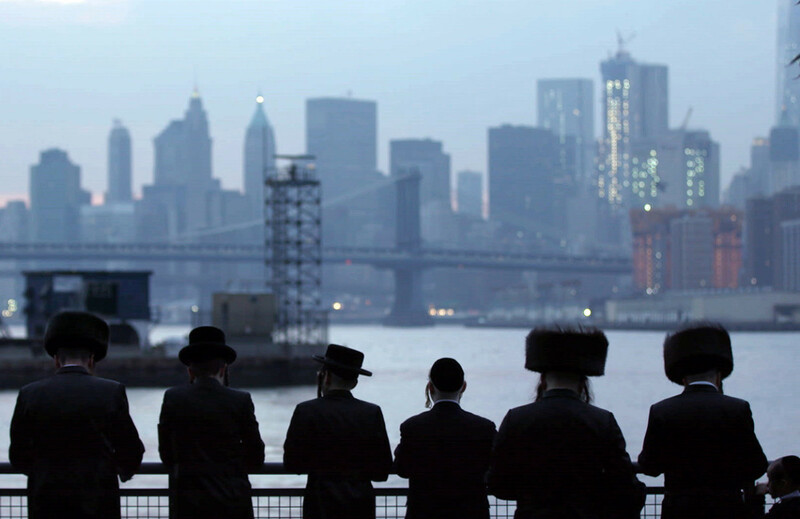 Quoted in John Guerrasio, "How a Netflix Documentary Got Inside New York City's Intensely Insular Hasidic Community," Business Insider, Nov. 21, 2017. See Zalman Newfield, "Few Who Leave Chasidic Life Lose Their Families," New York Jewish Week, November 7, 2017. Weiss, Shayna. “"They Have Their Own Language, Literally": A Review of One of Us.” In geveb, January 2018: https://ingeveb.org/blog/they-have-their-own-language-literally-a-review-of-one-of-us. Weiss, Shayna. “"They Have Their Own Language, Literally": A Review of One of Us.” In geveb (January 2018): Accessed Apr 22, 2019.